Robert Chappell (Bob) trained as an optometrist at City University London. He works in the UK as a community optometrist. Bob has a lively interest in optometric professional and political matters. He is a Past President of the College of Optometrists He was also a member of the General Optical Council the UK regulatory body for optometrists and dispensing opticians for 25 years. Involvement in European and international optometry has been as President of the World Council of Optometry and President of the European Council of Optometry and Optics. 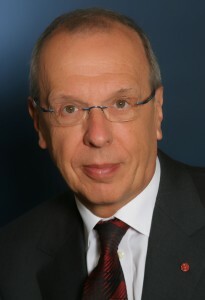 He is currently Chairman of the Board of Management for the European Diploma in Optometry and Chairman of the Legislation, Registration and Standards Committee of the World Council of Optometry. In 2006 he became a trustee of the International Agency for the Prevention of Blindness and in 2009 a trustee of Sightsavers, an international visual impairment NGO. He has a particular interest in the international mutual recognition of qualifications to facilitate the free global movement of professionals. A joint author of the WCO Global Competency model for optometrsits he has also been closely involved in the development of the European Diploma and the ongoing work to recognise prior learning and achievement in Europe. In the 1995 Queen’s Birthday Honours he was awarded an OBE for services to optometry and in 2001 the degree of Doctor of Science (Honoris Causa) was conferred on him by City University, London.